Favorite subject line of all emails received last week: kati goes 80s at h&m. 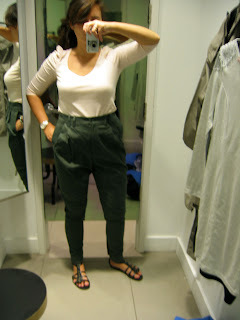 And attached are photos of some not-too-80's looks Kati tried at H&M on 34th & 7th. Pink top with exaggerated shoulder, $12.95. Love. Green pants with modified drop-waist, $49.95. Almost love. I want the waist to be higher, and, as Kati pointed out, the side view is all "mom jeans." Bad 80's. Two dresses, the ever-present black bandage dress ($24.95), and a really great winter white dress. Click to check out the cool rope pattern on the shoulders ($34.95). Kati was a little horrified by all the 80's styles in H&M. We commiserated on how "it's everywhere" and wondered "how are we going to wear this?" By "we" I mean "her" because I'm hoping maternity leave will help me escape from fall/winter 80's, and by spring we'll be onto some other decade. I don't hate the 80's, I was just expecting it to die already. And all 80's all the time is, in my grouchy, post-holiday weekend opinion, yuk. But I was comforted by Kati's reaction to the 80's takeover in H&M, as our 80's experiences vary greatly: hers being the decade she was born in, and mine being the decade I discovered black rubber bracelets, big hair, Naf Naf, and really tight jeans. What a lovely guest model! Right?! Beautiful! She needs that white dress.